Coach hire in London is on the increase due to the inflation in prices on other means of transport across our capital and the UK, Coach hire is the preferred method of transport for groups of passengers from as little as 8 to many thousands, we are at the forefront of our industry providing transport management for both small and large groups alike, from a transfer to any UK airport the most popular being London Heathrow and London Gatwick closely followed by Stansted and Luton airports, in addition to transfers we offer full UK coach tours and London coach tours which allow you take in the delights of many of the major landmarks in London, we are happy to follow any itinerary or tailor a specific itinerary for you. 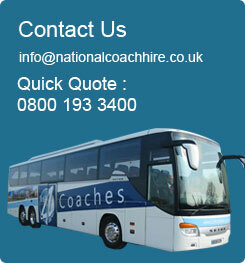 National Coach Hire is the number one choice for London coach hire. All the coaches supplied by National Coach hire in London are full executive coaches, we offer vehicles with toilet facilities, DVD and AC as a minimum, however this can vary in peak season so make sure you request these facilities when booking. Vehicle sizes range from 8 seater Mercedes Vianos with full leather to 61 seat coaches with full exec features, above this are the double deckers which offer seats anywhere from 71 to 85 seats with full exec features. A large percentage of our business is the returning corporate market place, we firmly believe we have the knowledge and expertise in this sector which sets us head and shoulders above the competition, please feel free to contact us to discuss your forthcoming company event, business travel or VIP coach travel or simply fill out the quotation form and we will contact you within 15 minutes of your enquiry. If you are an event management company looking for a reliable coach hire company for your event coach hire travel or a nationwide corporate client and wish to place your business with one supplier with one point of contact then look no further, we offer this service as standard and you will find that we are available 24 hours a day 7 days a week, your calls will always be answered and dealt with in a swift and professional manner. We offer the best available market pricing for ground transportation across the UK, our service levels are amongst the highest you will come across, full travel documentation is always issued along with documented invoices, flexible payment terms are offered depending on the nature and frequency of bookings. We hope that you choose National Coach hire for you next booking so that we may demonstrate and deliver what we promise as standard, a reliable, cost effective and no nonsense service on some of London’s finest vehicles.